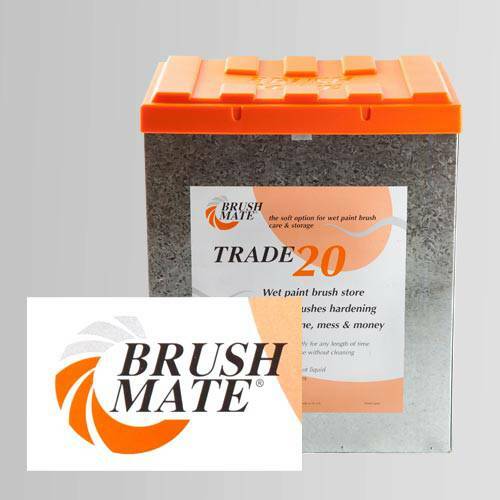 Say hello to the Brush Mate Trade 20, and say goodbye to the problems of brush care and storage. After painting, you simply clip your brushes into the Brush Mate Trade 20 and let the unique vapour system keep the brushes soft and pliable – ready for immediate re-use hours, days or even months later. Included is a year’s supply of Fluid (4 x 250ml) and 1 x Service Pack. Be warned, this Brush Mate could soon become your best mate! Click 'Redeem' and your Brush Mate 20 Paint Brush Storage System will be sent by courier to the address that you have registered with Dulux Trade Points. Please allow up to 10 working days for delivery. 1. Offer is valid for 1 x Brush Mate 20, 4 x 250ml Fluid and 1 x service pack. 2. The Brush Mate 20 and accessories will be sent via post to the address registered with Dulux Trade Points. Deliveries will be made using An Post/Royal Mail services. All orders will be sent by registered post and will require a signature on arrival. 3. Your Brush Mate 20 and accessories will normally be received within 10 working days. Where possible we will try to meet all delivery requirements but neither Dulux nor TLC Marketing shall be liable for any loss incurred either directly or indirectly by failure to meet the delivery date and time indicated at the time of order being placed. ‘Loss’ in this instance includes loss of profit, costs, damages, charges or other expenses. 4. Risk will pass to the customer upon delivery. Neither Dulux nor TLC Marketing can be held responsible for lost, stolen or damaged products following delivery to the recipient. The Brush Mate will NOT be replaced or refunded if lost, stolen or damaged.